On The Navajo Nation, 5,000 Workers Dependent On A Federal Paycheck Native American tribes are more dependent on federal dollars than many other communities. As the shutdown continues, Navajo Nation President Russell Begaye is asking Congress to exempt tribes. 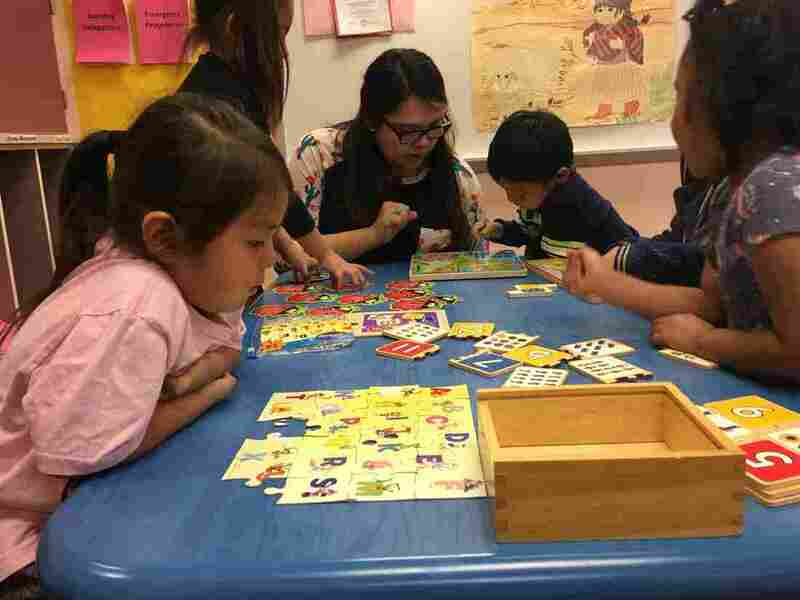 Teacher Shanelle Yazzie works with children at a Head Start facility on the Navajo Nation. Funds to keep the Head Start programs running are slow to reach these facilities during the federal government shutdown. With the partial federal government shutdown dragging on, Navajo Nation President Russell Begaye says Congress should exempt tribes from feeling the effects. Historically, treaties with the U.S. government have guaranteed the Navajo and many other tribes federal financial assistance for health, education and economic development. So the shutdown is having an outsized impact. On the Navajo Nation, half of the tribe is unemployed. But at least 5,000 tribal members rely on paychecks from the federal government. Missing one, which happened for the first time on Friday, can have painful ripple effects. Community leader Angela Cody said one paycheck often has to feed the immediate family as well as the extended family. "People are worried about their next mortgage payment, their car payments," Cody said. "At the family level there's a lot of stress, finance [sic] stress. As a whole we are dependent on these employees and federal monies every day in some way." Even if they aren't getting paid, many have to work and so they rely on the federally-funded preschool program, Head Start, to care for their young kids. As a whole we are dependent on these employees and federal monies every day in some way. But the tribe's Head Start program is already shrinking. They lost ten centers last year because there were no buses available to shuttle kids from across the rural reservation to classes. Now, the program doesn't have the enrollment numbers it needs to stay open. "I have 12 now," Head Start teacher Jensen said. "We're supposed to have 15. We can't seem to get enough children because of the distance." Many federal offices across the Navajo Nation are closed because of the shutdown. The federal money Head Start relies on to run the program has been slow to arrive. "We don't have enough cleaning supplies," Jensen said. "It's a long process to get those kinds of things and so a lot of times we're buying our own supplies to get the kids hands clean." To make matters worse, unplowed roads made it near impossible for parents to drive their kids to Head Start since the shutdown began. During snowstorms in recent weeks, only half of the Bureau of Indian Affairs crews who help the tribe maintain the roads showed up to clear snow. And those who are working aren't getting paid. There are 1,600 of paved roads and almost 6,000 miles of dirt roads on the Navajo Nation. Head Start teacher Shanelle Yazzie said she could barely get to work. "The only roads being plowed over the last two weeks were the main interstate," Yazzie said. "We don't really travel on that so. The only way you can get by was probably on a four by four and not many people have that out here." If a dirt road isn't maintained during a snowstorm, a couple things can happen. The snow can melt and make the road impassable or the snow piles up. Either way you're stuck. Navajo president Russell Begaye said many Navajo live without running water and electricity, so they have to haul water to drink and wood to stay warm. And they have to eat. "Getting out to buy groceries, or maybe there's an emergency where they have to transport a family member to a hospital, maybe to refill their medication or to refill their oxygen tank — so it's a life or death situation in many instances," Begaye said. Begaye said if the shutdown continues it's only going to get worse, as the National Weather Service predicts more snow next week.